At first it was the Muslim Brotherhood. Now dozens of journalists, non-Islamist activists and students have been detained and beaten. The Abu Zaabal prison complex lies some twenty miles northeast of Cairo, where the dense urban cacophony of the capital quickly gives way to rolling fields, rubbish-strewn canals and small clusters of hastily built red brick buildings. Outside the main gate—a pair of large metal doors flanked by Pharaonic-themed columns—sit four army tanks, their long snouts pointed up and out. Gehad Khaled, a 20-year-old with an easy laugh and youthful intensity, has been coming to Abu Zaabal on a regular basis for nearly four months to visit her imprisoned husband. Abdullah Al-Shamy was among hundreds rounded up on August 14, the day security forces violently stormed two sit-ins in Cairo and Giza that formed the epicenter of support for the deposed president, Mohamed Morsi, leaving up to 1,000 people dead. Abdullah was at the Rabaa Al-Adeweya sit-in for work. As a correspondent for the satellite news channel Al Jazeera, the 25-year-old journalist had been stationed at the pro-Morsi encampment for six weeks, becoming a familiar face to the channel’s viewers in one of the summer’s biggest international news stories. Gehad would visit Abdullah at the sit-in, where he was working around the clock. The two had been married in September 2012, though Abdullah spent little time at home because of regular deployments to countries like Mali, Libya, Ghana and Turkey for Al Jazeera. “The longest period we spent together since we were married was in Rabaa,” she says with a smile. Now, Gehad sees Abdullah just once every two weeks inside Abu Zaabal, waiting hours each time for a fifteen-minute visit. She brings him food, water, clothes, newspapers, books, toiletries and other necessities to alleviate the austere conditions inside Egypt’s jails. The prison waiting room is bustling with other families carrying plastic bags and suitcases of supplies. Children scamper around their parents, women carry babies. Over the past few months, thousands of Brotherhood members and Morsi supporters have been rounded up and thrown in prison. 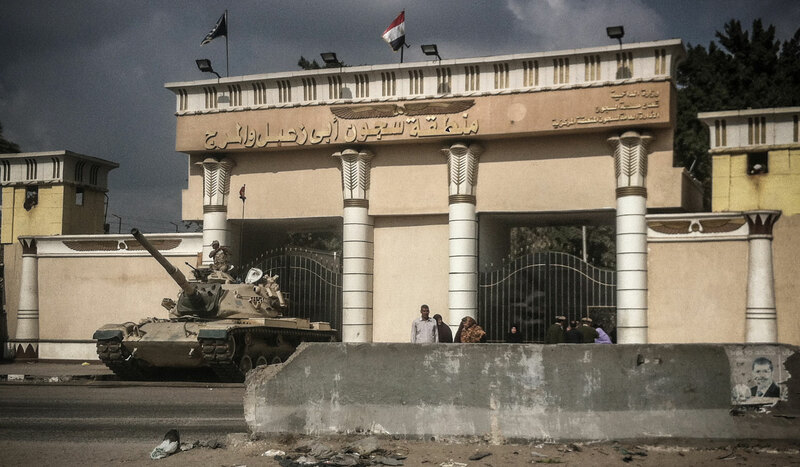 More than 700 of those arrested in the August 14 raid on Rabaa were imprisoned at Abu Zaabal, and the walls of the waiting room bear the signs of the political divisions that have torn Egypt apart. Drawings of a hand holding up four fingers, a symbol for Rabaa (Arabic for “four”), are scrawled in felt pen alongside slogans such as “Down with military rule” and “CC the killer,” in reference to army chief Abdul-Fattah el-Sisi, who deposed Morsi on July 3. Some of the graffiti has been angrily crossed out by family members of prisoners convicted of regular crimes who oppose the Brotherhood. Similar divisions exist within Gehad’s own family. Her father is a member of the Muslim Brotherhood and a staunch supporter of Morsi, yet Gehad, who has began protesting the regime since 2008, says she doesn’t support the group and accuses them of abandoning the revolution. In what has become an increasingly common phenomenon in Egyptian society, the political cleavages within her family often spilled over into heated disputes, compelling her to refrain from discussing politics with her parents and siblings. Despite her misgivings about the Brotherhood, Gehad spent a lot of time in the pro-Morsi Rabaa sit-in, not just to see her husband but to be a part of the protest. “We have been standing against the military since 2011, and we still are now,” she explains. “We didn’t change our position, the Brotherhood did. Now they stand against the military too. We are continuing, and they have joined us.” Her attitude is not shared by other revolutionary activists who view the Brotherhood not just as political opportunists but as a separate wing of the counterrevolution. These activists point to abuses the Brotherhood committed during their time in power as justification for refusing to join even a tactical alliance with them against the military after the coup. Abdullah’s younger brother, 23-year-old Mosa’ab, sits next to Gehad in the waiting room. Mosa’ab also spent a significant amount of time in Rabaa, but only in his capacity as a journalist, not as a protester. A talented and intrepid freelance photographer, one of his photographs, from a police attack on the sit-in on July 27 that left dozens dead, was selected as one of Time magazine’s Top Ten Photos of 2013. Similar divisions plague the Al-Shamy family as well. Mosa’ab says his father, a Brotherhood member, and his eldest brother, Anas, are often a united front arguing vociferously against him, Abdullah and his younger brother, all of whom were more critical of the Brotherhood and Morsi. “It wasn’t pleasant,” Mosa’ab says. On August 14, the day of the police raids, Mosa’ab was in frequent phone contact with Abdullah as they both covered the carnage unfolding in Rabaa. Their youngest brother, 19-year-old Mohammed, a photographer working for the Turkish news agency Anadolu, was there as well. Mosa’ab and Mohammed left together in the afternoon, not long before security forces had completely moved in and cleared the sit-in. By nightfall, Mosa’ab found out that Abdullah had been detained, arrested by security forces as he was walking out of Rabaa with Gehad. Nearly four months later, he remains imprisoned, and there have been no significant developments pointing toward his release. Like thousands of protesters arrested over the past few months, he is accused of inciting violence, disturbing the peace and destroying public property. Abdullah has spent the past four months struggling to endure the monotony of prison life. He spends his days reading, writing and speaking to other prisoners. He shares a cell with sixty-six other men, in a room approximately forty square meters. There are no beds; prisoners sleep on the floor, with blankets provided by their families. For the first eight weeks, hardly any water was provided, and prisoners had to structure an equitable sharing system in order to shower. The cell is open for an hour a day, when prisoners can walk around the building but are not allowed outside. Ever the journalist, Abdullah has spent much of his time in prison interviewing all of his fellow detainees and documenting their cases. He plans to write a book once he is released. He says those imprisoned with him include Islamists spanning different ideologies as well as street vendors, minors and even one man detained simply for standing near police on the day of the Rabaa raid who says he is staunchly opposed to Morsi, voted for his rival in the presidential election and took part in the anti-Morsi protest on June 30 and the pro-military one on July 26. He was taken to the nearby Cairo stadium, where prisoners were being mistreated and harassed by the police. The next morning he was transferred with several dozen others to a police station, where they were greeted by the notorious “welcome party”—a common practice of forcing incoming detainees to run through a gantlet of waiting soldiers, who beat and whip them with sticks and belts. Once inside, police stole money, watches and IDs from the prisoners while continuing to beat and humiliate them, Abdullah says. All of them were eventually transferred to Abu Zaabal, where they have remained ever since, relying on regular supplies of food, water and other essentials from relatives, as is customary in Egypt’s crippled prison system. In the deepening polarization following Morsi’s overthrow, many pundits on private media outlets have voiced complete support for the military, adopting its language of a “war on terror” and vilifying Al Jazeera and demonizing all Islamists as violent extremists unfit for political life. “The polarization was a big divide that resulted in a lack of empathy and solidarity between journalists,” says Sherif Mansour, the Middle East and North Africa coordinator for the Committee to Protect Journalists. “This is one of the main reasons we’ve seen these attacks on journalists increase but also go unpunished.” Seven journalists, including Abdullah, are currently imprisoned in Egypt, according to Mansour, while dozens of others have been briefly detained. Meanwhile, after months of a vicious crackdown targeting the Muslim Brotherhood and Morsi supporters, the Interior Ministry has turned its attention to the activist community that first launched and sustained the revolution. Prominent figures, like blogger Alaa Abd El Fattah and Ahmed Douma, have been arrested in the middle of the night at their homes and accused of violating a draconian new anti-protest law. Dozens of non-Islamist protesters—among them some of the country’s most notable female activists—have been detained during peaceful demonstrations and beaten and abused while in police custody. And security forces have tried to quell a growing firestorm of protest and dissent on university campuses with brute force, killing at least one student and arresting scores in mass sweeps. Read David Mizner on hunger strikes around the world.